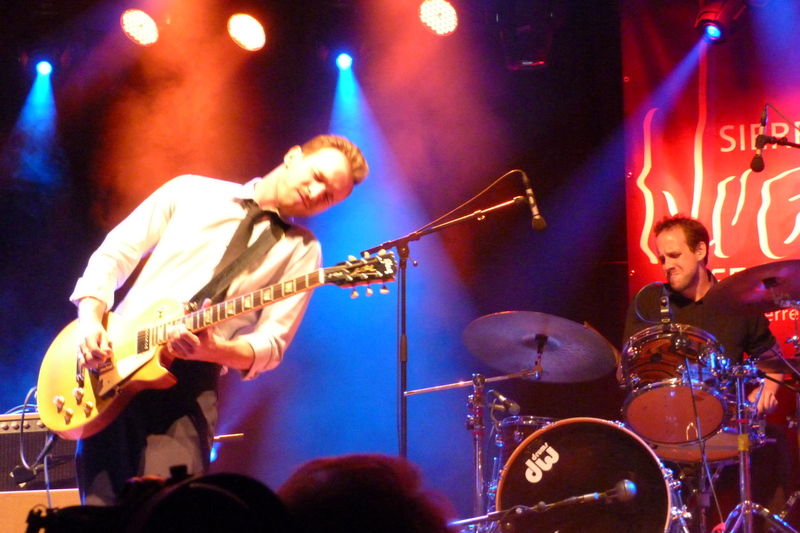 The whole purpose of going to Switzerland was to see Josh, aka The JW Jones Band, play at the Sierre Blues Festival. The band was on tour and had already played at a festival in Tenero, Switzerland and La Cheze, France. We were catching up with them for their last gig of the tour. Josh’s tour manager booked the band into a B & B hotel outside of Sierre for their day off. We arranged to stay in the same place and meet up at some point in the late afternoon or evening – depending on all of our travel arrangements. Tim & I arrived in Sierre knowing that we would have to take a bus or a Funicular to the hotel, but not really understanding that the hotel was in an entirely different town halfway up the mountain. 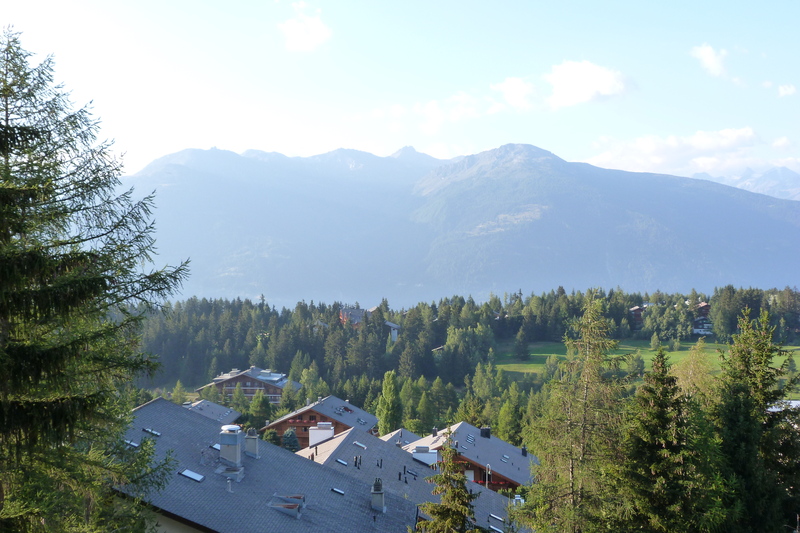 In fact, we were staying in Crans Montana, a resort community dedicated to golf in the summer, skiing in the winter. The bus ride to Crans Montana was a harrowing experience to say the least – barreling along narrow switch back roads with a bus driver that clearly knew no fear. We zipped up the mountain, to 1500 meters above the Rhône River valley. But once we got there we were rewarded with an amazing mountain experience. Our room at the B & B overlooked the Alps, the silhouette of the Matterhorn in the distance, the air mountain fresh. The town itself is predictably oriented toward luxury. Stores that specialize in anti-aging products. A caviar bar. A cigar store. Again, we are out of our financial league. Josh and the band arrived, and we got to meet Ella, Josh’s new lady love who is bravely travelling with the boys through France and Switzerland. Josh, Jeff & Jessie make up the JW Jones Band and they had a tour manager and driver, Dina, from Germany who looked after everything. But even Dina couldn’t find us a cheap place to eat dinner in this town. We settled on a Thai restaurant, of all things, but the food was surprisingly good, especially after we’ve had long days on the road. Bowls of grains. This was mystifying at first. Dried wheat, barley, rye, oats and many others that I couldn’t identify nor translate. Next to the grains was a small hand grinder. After watching someone else, I saw that you put a spoonful of your selection into the grinder and grind it into a bowl. Low and behold you’ve made your own cereal for breakfast. a plate of cheeses and dried meats, salamis, prosciutto etc. bacon, scrambled egg, and a lovely hot bowl that held what looked like sand in which sat perfect boiled eggs. This is what I can remember. There was much more. Plus a archetypical lovely “Swiss Lass” who brought us coffee and hot water in a beautiful silver service. Needless to say we took our time. We also took the advice of the band and surreptitiously made sandwiches for later. After breakfast, the band checked out to move to their Sierre location. The Festival organizers had put them up in the plush Château Mercier. 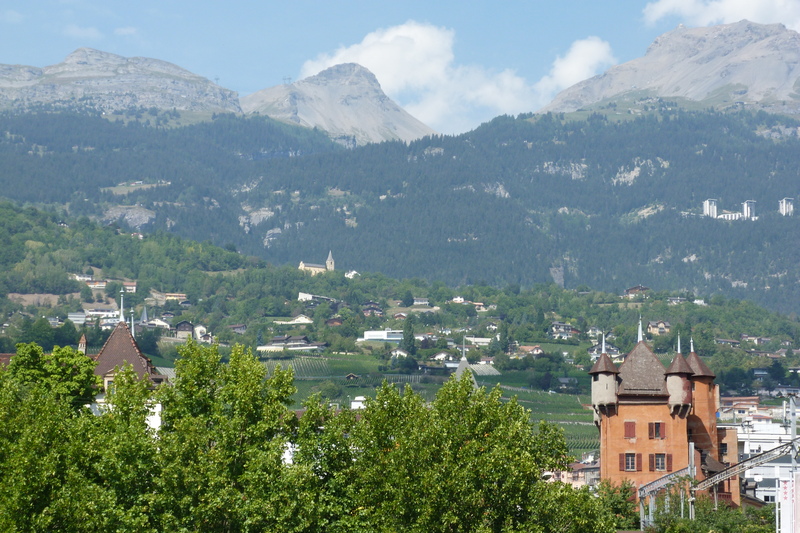 It is very posh, set amongst vineyards yet only a 5-minute walk from downtown Sierre. The band settled into their new digs while Tim & I went off to explore town. It is charming, with everyone full of smiles and good humour. There are 3 official languages in Switzerland: French, Swiss-German, and Italian. We muddled along in our ghastly French and were embarrassed to hear the ease with which people switched in and out of all of the languages. We met up with the band again at their sound check. Josh was really impressed with the professionalism of the Sierre team. He was happy with the equipment that they’d brought in and everything went quickly and efficiently. It was blazingly hot, so we made a plan to go to explore the lake. However, we ended up getting separated and Tim & I decided that we couldn’t walk to the lake in the heat. The band was in their car, somewhere, but we took a different route and ended up at the Reiner Marie Rilke museum. This would have been more exciting if some of the information at the museum had been in English. We deciphered what we could, absorbed the photos and moved on. 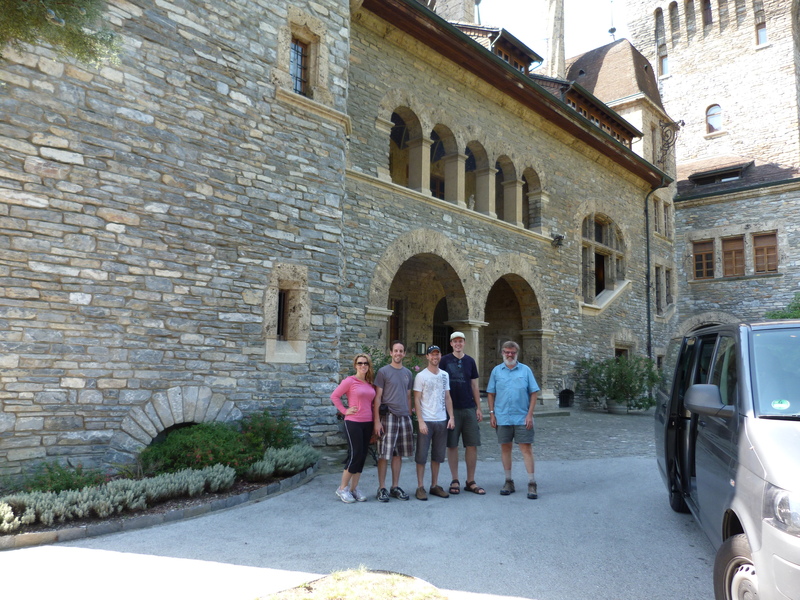 Josh’s band was scheduled to start at 11:30 p.m. and our special bus back up the mountain to Crans Montana was to leave Sierre at 2:00 a.m. Tim needed to get a bit of a break from the heat, from the walking, so he headed back to the B & B, taking the Funicular (which was a whole other kind of terror, he tells me later) while I kicked around town a bit. One of the other bands that we met at the Château Mercier was “Davina and the Vagabonds”, from Minneapolis. 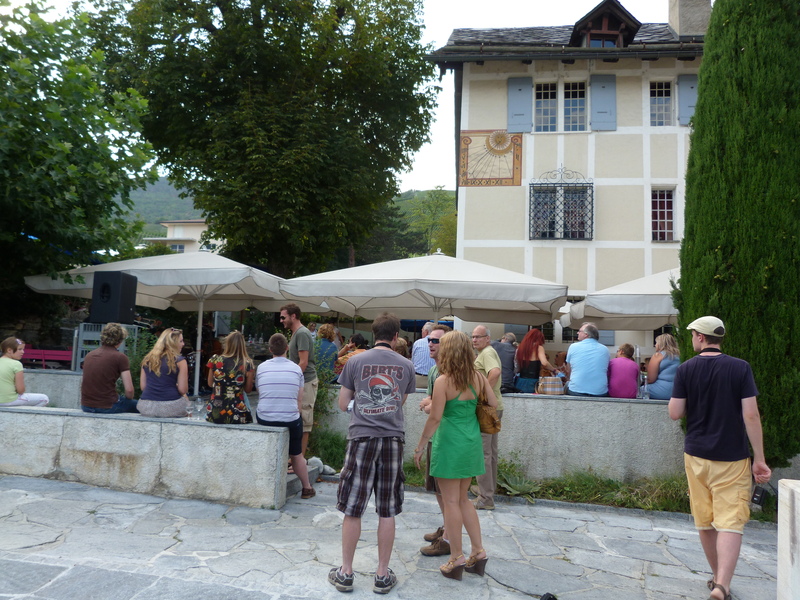 They were playing a gig at 5:00 at the Château de Villa, on the outskirts of town but still only a 10 minute walk. Built in the 16th century, the Château houses a “cave”, L’Oenothèque de Villa, with a selection of wines from over 100 local vintners. There is also a museum dedicated to wine and the wine growers of the region. I looked wistfully at the walking map that would take me on a wine tour, walking from Sierre to the nearby town of Salgesch. But it was blazingly hot and it was going to be a very long night. So I settled for a lovely local Rosé on the terrace, to listen to Davina and her band bounce into some very good Dixieland sound. At 7:30 Tim and I met up with the band, backstage. We had our own backstage passes! We got to eat and hang out with all of the musicians. The organizers put together a good feast that included gazpacho, chicken with wild mushrooms, rice, salad, fresh peach tart and an open bar of Swiss wines and beers. There was even some raclette on offer later in the evening. We watched the bands, waiting for the main event. 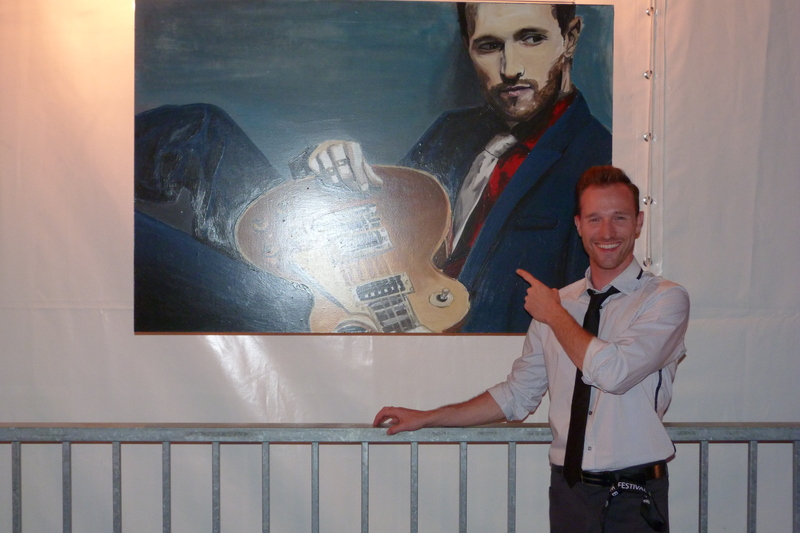 The organizers had also put together an exhibition of paintings of all of the musicians and we were all really excited to see a huge painting of Josh in the VIP tent. As it turns out, JW didn’t actually start his set until midnight. But what a set! We’ve seen JW in Ottawa at the Rainbow many times. But this was entirely different. The huge stage with the Alps as a backdrop. The fabulous light show. The screaming groupies (not just us – there were lots of others who have travelled from long distances to see this band). JW and Jeff and Jessie are a hot live band and they delivered. You can watch it on You Tube. We danced, we clapped, we screamed. He conquered. It was a great night. Just before 2:00 we hobbled over to the bus. Turns out we were the only ones who needed the drive up the mountain (the organizers had planned for everything, except for the low turn out). The twists and turns didn’t seem as bad this time around and we were soon tucked safely into our room, already dreaming of tomorrow’s breakfast.